WAIST HIGH: Happy 25th Birthday Special Beat Service. 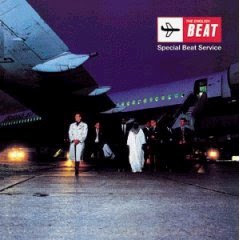 Happy 25th Birthday Special Beat Service. Waist High favorite Special Beat Service was the third and final album by The Beat. It reached #39 on the Billboard 200 album chart in 1983. Special Beat Service features the greats "I Confess," "Jeanette," "Sole Salvation," "End of the Party," and "Save It for Later." "Special Beat Service is one of those rare recordings that never loses favor or fades with age. The English Beat are on top of their game here, singing and playing with madcap energy. The songs--a riot of riffs, driving percussion, high energy horns (particularly saxes), punctuating bass, shimmering guitar, spot-on keyboards--still sound brash and bold. And the vocals are a thing of wonder--soaring and confident."